The Purple Carrot continues to celebrate our local foods, area eating and drinking establishments, and chefs with its Garden Party dinner to be held on Wednesday, September 12 in the Ballroom Gardens. Crafted by Chef David of The Falls Ballroom Banquet & Catering Services and Jessie Bavelli of Sprout Food Hub, the menu will feature the last tastes of summer and preview of the fall harvest. Poulet Sauvigon – oven roasted chicken breast covered in a mushroom and red wine reduction sauce. Candied rainbow carrots and smokey au gratin potatoes with diced peppers and onions. You will be served a glass of wine to enjoy with your meal. *Menu is subject to change due to the seasonality of locally sourced produce. You do not need to be an owner of the Purple Carrot to attend, however, owners will receive a limited edition gift that evening. So become an owner on or before September 12! 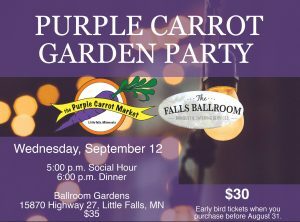 Tickets are available online from the Purple Carrot’s website (www.purplecarrotmarket.coop) or at the Shoppes of Little Falls. To reserve a table for 8 or 10 guests, please email us a purplecarrotmarket@gmail.com or call Susy at 320-632-6341. Thank you to our partners, Januschka Family Farm, Sprout Growers & Makers Marketplace, and Thrivent!